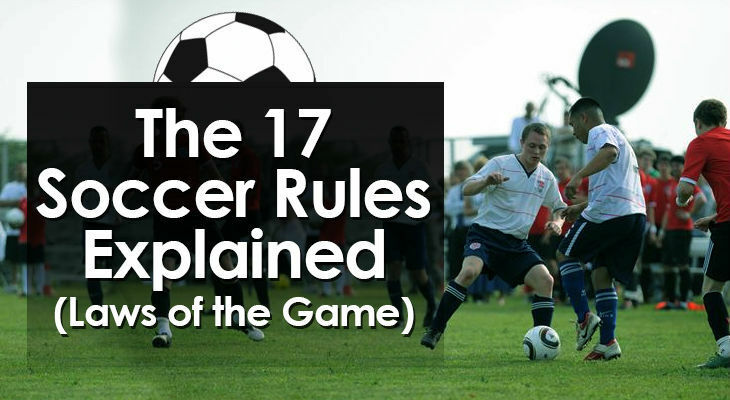 You need to understand the basic soccer rules to know what’s going on throughout a match. And fortunately, the rules of soccer are quite simple! There are 17 fundamental “Laws of the Game” which I’ll discuss below. 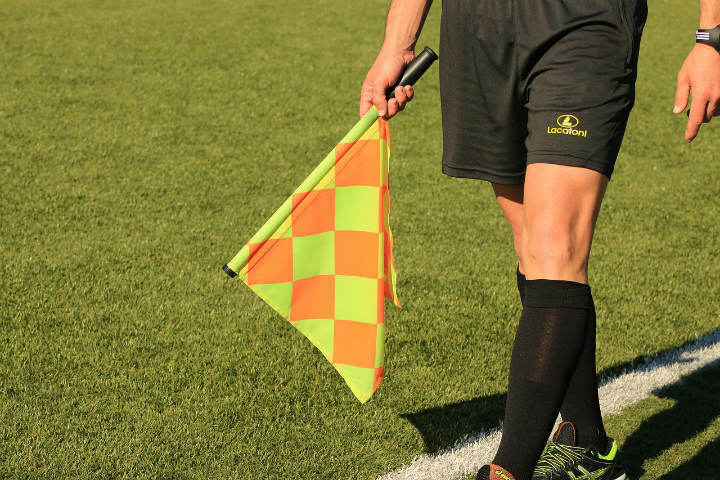 By the time you finish this blog post, you’ll understand what a red card is, why a player was flagged offside, why a team was awarded a penalty kick, and much more. The first rule looks at how the field is set up. In the standard 11-a-side match match, the pitch must be 90 to 120 metres in length and 45 to 90 metres wide, with the touchlines being longer than the goal lines. The field of play is made up of white lines all around the pitch and is then split in two by the halfway line down the middle which runs parallel to the goal lines. The centre circle (where the game kicks off) is located at the midpoint of this line. In each corner of the pitch there is a flag post and these help judge whether a ball has gone out for a corner / goal kick or a throw in. At both ends of the pitch is a goal which is placed in the middle of the goal line. In front of both goals is a small goal area and around that is the larger penalty area. The penalty spot is also marked in the penalty area and it lies 11 metres from the goal line. 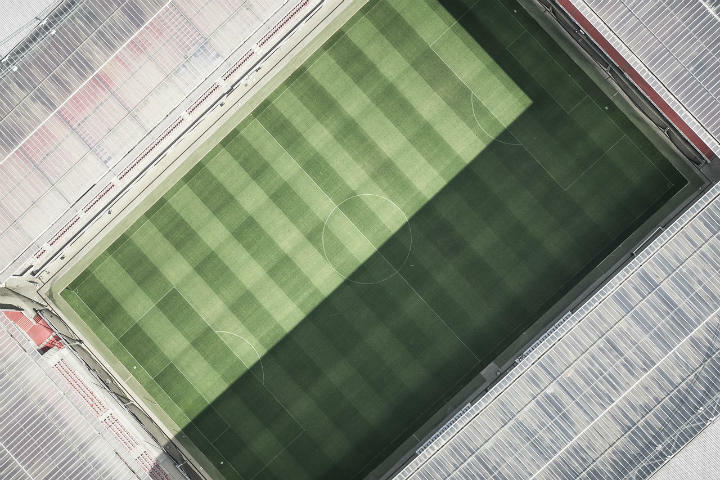 While all of these lines and areas may sound complicated, after watching a single game of soccer you’ll have clear idea of how the pitch should be set up for a match. 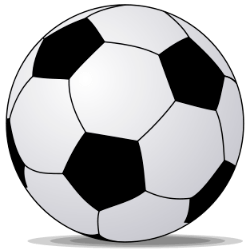 A regulation soccer ball should be spherical and must weigh between 410 and 450 grams. In addition to this, the ball should be inflated to between 0.6 and 1.1 standard atmospheres. While this sounds very scientific, in reality all soccer balls will weigh around that weight once they’ve been inflated to a reasonable pressure. Adult and adolescent soccer uses size 5 balls, U12’s use size 4 balls, and U4’s (toddlers) use a size 3 soccer ball. ​According to the official soccer rules, standard soccer has two teams playing against each other both with 10 outfield players and a goalkeeper on the field. This means teams should each start with 11 players. Although you can play with almost any number of players while kicking about with friends. But in general, each team is only allowed to make three substitutions per match. If a player receives a red card and is sent off the field, that team has to continue playing with only 10 players as you can’t sub off a player who has been red carded. Players can’t wear anything that may cause an injury to themselves or any of the other players. For example, watches or jewellery are not permitted. Soccer players need their team’s shirt, shorts, and socks. They also have to wear shin pads (which must be covered by the socks) and soccer boots which have the appropriate studs on them. Goalkeepers must wear a team jersey that is a different colour from their teammates and they should also wear goalkeeper gloves throughout the match. To keep things fair, there is a referee who officiates the soccer match. And it’s up to them to keep the game flowing and keep the players under control. Wearing a different colour jersey from both of the teams playing, the referee is assisted by their two assistant referees who patrol the touchlines. Before the match begins, the referee needs to check the ball and see that all players are wearing the correct equipment. After that, the game begins when the referee blows their whistle and it’s up to them to act as timekeeper and also record what happens in the game. Such as goals and cards that they have handed out. The referee has the power to stop the game whenever they think there has been a foul. They decide when to award penalties, fouls, goal kicks, free kicks, corners, and throw-ins. It’s also up to them to book players if they have been overly aggressive or have made a dangerous tackle. The referee's judgement is final so they have a very important role in ensuring that the game flows, is fair, and that the correct calls are made. Running up and down either touchline are the two assistant referees. It’s their job to flag when the ball has gone out of play and which side should be awarded the goal kick, corner, or throw in. They also let the referee know when a player has been caught offside or when a foul has happened near to where they are. In addition to this, they also let the referee know when a team wants to make a substitution. The assistant referees help the referee to officiate the game but it’s ultimately the main referee who makes all the decisions. A typical game of soccer lasts for 90 minutes. The game being divided into two halves of 45 minutes each. Between these two halves is a 15 minute half-time interval where play is stopped and the two teams have a break before play is resumed. At the end of each half of the match, the referee may add on extra time if appropriate. Extra time can be awarded for any substitutions that have taken place during the game, any injuries that occurred, how long it took for injured players to leave the field of play, and in some cases, when time wasting has gone on. 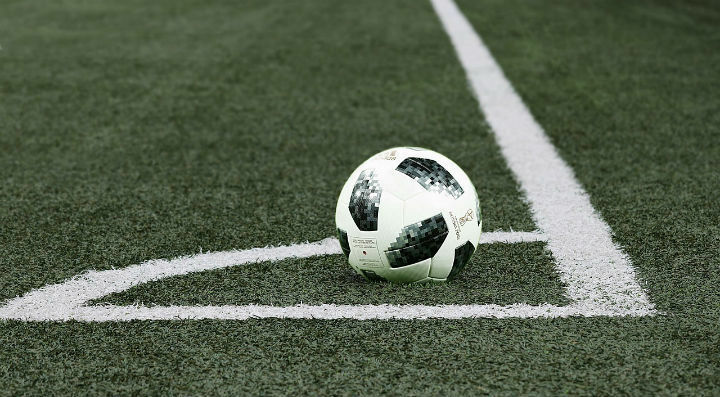 To determine which team starts the match, a coin is tossed and the winner decides whether their team will kick-off the first half or the second half. In the second half, teams change ends so they’re attacking the opposite goals. A kick-off can occur at various points throughout a match. During a kick-off, the players of both teams must be in their own half of the pitch. When the first player kicks the ball, it must go forward and they cannot touch it again until another player has touched the ball. Also, when a team scores a goal, it’s the other team who takes the next kick-off. The ball is out of play when it has completely crossed the touchline or goal line. It’s also considered out of play when the referee blows their whistle to stop the game. Apart from these two situations, the ball is always considered to be in play and this includes when it rebounds off the goalpost, referee, or corner flag and stays on the pitch. So, how does a team win a game of soccer? The team who scores the most goals during a match is declared the winner. If no goals or an equal number of goals are scored, it’s a draw and neither team wins. While this is generally the way it works, in some competitions there are different soccer rules which may require that a team wins even after a match has been drawn in regular time. For example, extra time or penalty kicks to determine a winner. A goal is deemed to have been scored when all of the ball crosses over the goal line in between the goalposts and under the crossbar. It only counts if no foul or infringement was committed in the build up play to the goal. Many people consider the offside rule to be the most complicated in the game. It’s not that difficult to grasp once you’ve read the definition and watched a couple of games. A player is considered to be offside if they are nearer to the opposition's goal line than both the ball and the opponent's second last player when they impact the play. Well, as the game occurs at breakneck speed, it can be difficult for the referee and assistant referees to make the right call. What is for certain, however, is that a player cannot be offside if they are in their own half, if they are level with their last opponent when the ball is played to them or if the ball is played back towards them when they are in the opposition's half. On top of this, a player is only penalised if they are in an offside position and are either interfering with play, interfering with an opponent or are gaining an advantage from being in that position. And a player cannot be offside when they receive the ball from a corner, goal kick, or throw-in. During the match a referee may award a direct free kick, indirect free kick, or penalty if they deem that a player has been fouled. For a direct free kick to be awarded to the opposition team, a player may have done one of the following to a player on the opposite team. Kicked, tripped, jumped into, charged, struck, pushed, etc. Alternatively, they could have fouled them when attempting a tackle, held onto them illegally, or handled the ball deliberately. In each of these scenarios, the direct free kick awarded is taken from the position on the pitch where the offence occurred. A penalty kick is awarded to the team if any of the offences mentioned above are committed by the player committing the infraction in their own penalty box. An indirect free kick is awarded when a goalkeeper has the ball in their hands for more than six seconds, touches the ball with their hands when it was kicked to them by a teammate, or touches the ball with their hands after receiving a throw-in directly from a teammate. An indirect free kick may also be awarded if a player plays in a dangerous manner, impedes an opponent from playing fairly, or stops the goalkeeper from releasing the ball from their hands. As with the direct free kick, the foul is awarded in the spot where the infraction was committed. On top of being penalised and giving away a free kick or penalty, a player may also received a caution in the shape of a yellow or red card. Deliberately leaving the pitch without the referee's permission. 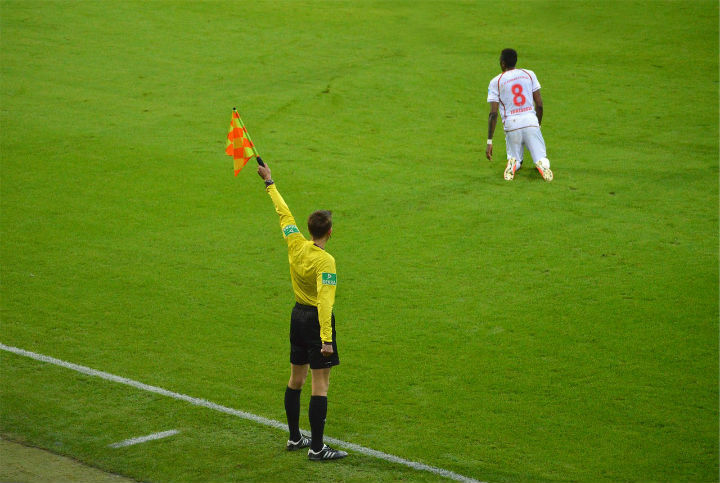 While a yellow card (unless it is a second one) allows the player to continue playing the match, a red card means that they have been sent off and must leave the field. As we’ve already talked about, free kicks can be either direct or indirect. For both of them, the ball is placed where the offence occurred and it must be stationary before the player strikes it. Then once the kick has been taken, they cannot touch it again until another player touches it. With a direct free kick, a player may shoot at goal if they wish and a goal would count if the ball crossed the line. An indirect free kick that crossed over the goal line would only count if it had touched another player before entering. For all types of free kicks, the opposition may erect a wall to block the ball, but this must be at least 9.15 metres away from the ball. A penalty is only awarded against a team if one of their players commits one of the offences mentioned above inside their team's penalty area. It’s up to the referee to award the penalty and the player taking it may score directly from it. a. The ball must be placed on the spot and the penalty taker clearly identified. b. The goalkeeper must remain on their goal line and between the goalposts until the penalty taker strikes the ball. c. Other than the defending goalkeeper and the penalty taker, no other players are allowed in the box. d. The player must kick the ball forwards and cannot touch the ball after striking it until another player has touched it. Having struck the ball, it is now considered to be back in play. A penalty that has been scored may be ruled out if an infraction has been committed either by the penalty taker or from one of their teammates running into the box too early. If the penalty has been missed, it may still be taken again if the defending goalkeeper committed an infraction or if one of their teammates enters the box too early. A throw in restarts play and is awarded to the opponents of the player who last touched the ball when it went out of play anywhere along the touchlines. To correctly throw the ball back into play, the player throwing must have both their feet on the ground, be facing the pitch, and throw the ball over their head using both hands. A foul throw may be called by the referee if the player does anything incorrectly and the throw could then be awarded to the opposition. Also, a player may not score directly from a throw-in. A goal kick is awarded when the attacking team puts the ball out of play behind the goal line without the ball having passed between the goal posts. The opposition team then kicks the stationary ball from anywhere in the goal area to restart play. The ball must pass beyond the penalty area for it to count and the kicker cannot touch it again until another player touches it. While taking the goal kick, no opposition players are allowed inside the penalty area. A corner kick is awarded when the defending team puts the ball behind their own goal line without it having gone between the two goal posts. To take the corner kick, the ball is placed next to the corner flag and is kicked by a member of the attacking team. Until the ball re-enters play, all opposition players must remain at least 9.15 metres away from the corner. If the ball goes directly into the opposition's goal from the corner, it counts as a goal (although this is very hard to do!). There are a couple of scenarios when an infringement may be called during the taking of the corner. If there is a lot of jostling in the penalty area, for example, the referee may ask for it be taken again. Alternatively, a goal kick may be awarded to the defending team if the player taking the corner mistakenly kicks the ball out of play. While some of them may initially seem to be a little complicated, after watching a few soccer matches you'll easily be able to pick up on a number of the soccer rules we’ve discussed here. It’s important for coaches to understand the rules of soccer to educate players and to ensure they’re always playing by the Laws of the Game. Parents and players are also encouraged to learn basic soccer rules. Once you do learn them, it makes soccer an even more enjoyable sport to watch.